Delight your guests with the key to your heart when they find these rustic styled bottle openers at their seats. You can use the heavy Kraft paper tag as a place card or to impart a special heartfelt message. 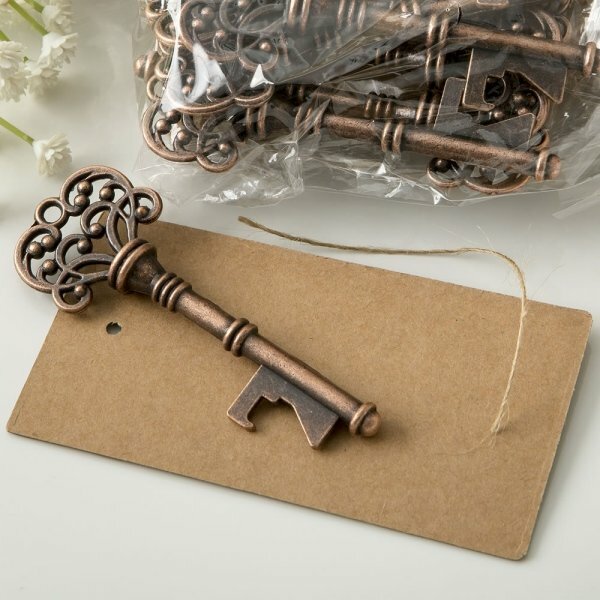 This key is crafted from one solid piece of metal and finished in an antique copper color. The head of the key has an elegant cut-out design and the bottom is especially cut in the shape of a sturdy bottle opener to open bottle caps. Priced individually. MUST be ordered in multiples of 10. Not ordering in multiples of 10 will delay your order. Is it possible to order the copper skeleton key bottle opener without the custom tag at a lower price? We don't offer personalization for the Copper Skeleton Key Bottle Opener with Place Card Tag. This favors has a heavy kraft paper tag and natural hemp string. It is also a great idea to use both as a favor and a table place card or for any personal message that you might want to impart on your special day. 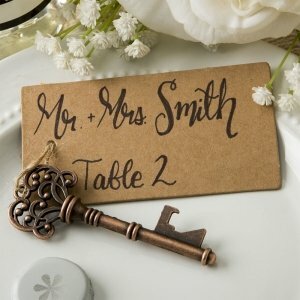 I had a question about the Copper Skeleton Key Bottle Opener with Place Card Tag. Is there an extra charge to personalize the place card tag? Unfortunately, the Copper Skeleton Key Bottle Opener with Place Card Tag can't be personalized so you will have to write something on the heavy kraft paper tag. You can write any personal message that you might want to impart on your special day. We also have the 'Key to My Heart' Vintage Wedding Favor Bottle Openers where you can add a personalized tag in the design of your choice for an extra fee of $0.35 but assembly is required, you can check out this link to know more about this item.